Hello my dear fashion addicted ladies! I am here to show you my favorite 15 boot trends to follow this year. You are about to see stunning designs and best ways how to wear them during cold season. I am 100% sure, you gonna want, love and need them this Fall and Winter months. How about wearing peep-toe ankle-boots in black leather? Try them on with black skinnies and cream-white sweater. No cold weather outfit is complete without a functional and gorgeously looking footwear. I believe all shoe-obsessed ladies who read this right now gonna be inspired by this flawless selection of must-have boots. This year many designer brands offer us fresh new styles that can be incorporated with any outfit. In this street style collection are gathered functional day-to-day ankle boots you can wear with everything to hot over-the-knee styles. No matter how tall, petite, skinny or big in size you are in clothing, there is no problem for you to find something that ideally fits your feet. 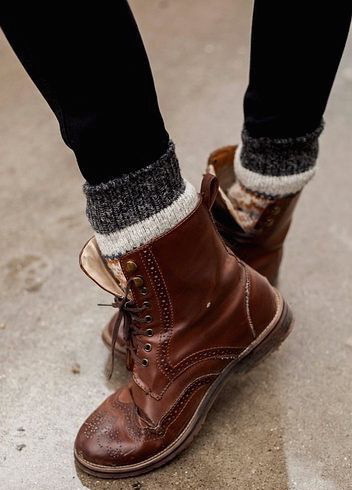 I think there will be no problem to find an appropriate boots that will make you look and feel happy.